A tweet from @georgiasisters purportedly shows Maha al-Subaie and Wafa al-Subaie, two sisters from Saudi Arabia who took to social media to plead for asylum. 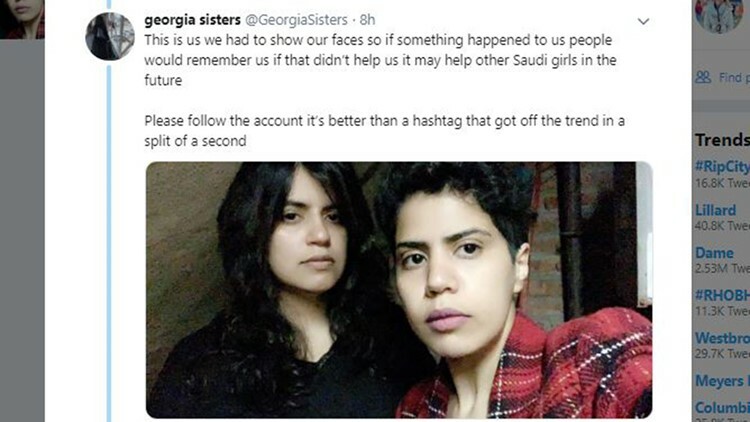 The sisters, tweeting from the former Soviet republic of Georgia, claim they will be killed if they are forcibly returned to Saudi Arabia. DUBAI, United Arab Emirates — Two Saudi sisters appealed for help Wednesday from the former Soviet republic of Georgia after fleeing their country, in the latest case of runaways from the ultra-conservative kingdom using social media to seek asylum. Using a newly created Twitter account called "GeorgiaSisters", they identified themselves as Maha al-Subaie, 28, and Wafa al-Subaie, 25. Like other Saudi women who have fled and turned to social media, they posted copies of their passports to establish their identities. The sisters claim they are in danger and will be killed if they are forcibly returned to Saudi Arabia. They said their father and brothers have arrived in Georgia looking for them. Wafa said they fled "oppression from our family" without elaborating. Saudis can enter Georgia visa-free, making the country a transit point for numerous other Saudi women who have fled in recent years. Saudi women who run away are almost always fleeing abusive male relatives and claim there are few good choices for them to report the abuse in Saudi Arabia. Saudi women caught running away in the kingdom can be forced into restrictive shelters, pressured to reconcile with their abusers or detained on charges of disobedience. Regardless of their age, women in Saudi Arabia must have the consent of a male relative to obtain a passport, travel or marry under so-called male guardianship laws . The sisters' first post to the Twitter account was Tuesday evening. It read: "We are two Saudi sisters who fled from Saudi Arabia seeking asylum. Yet, the family and the Saudi government have suspended our passports and now we are trapped in Georgia country. We need your help please." In another post, the sisters appear with their faces showing and their hair uncovered — a taboo for conservative families in Saudi Arabia. The post says they are showing their faces in order for the world to "remember us" in case something happens to them. In a later video posted on Twitter, Maha said: "We want protection. We want a country that welcomes us and protects our rights." Her sister posted another video calling for help from the U.N. refugee agency. "We fled oppression from our family because the laws in Saudi Arabia (are) too weak to protect us. We are seeking the UNHCR protection in order to be taken to a safe country," Wafa said. The sisters did not give further details on why they have fled. The Associated Press could not immediately reach the sisters in Georgia. A Saudi activist who goes by the name Ms Saffaa told the AP that she and other activists have had direct contact with the sisters in Georgia. Their cases mirror that of 18-year-old Rahaf Mohammed al-Qunun, who in January drew worldwide attention when she barricaded herself in an airport hotel room in Bangkok after fleeing her Saudi family during a trip to Kuwait. Her social media pleas on Twitter prompted quick action by the UNHCR and she was granted asylum in Canada. There had been speculation that al-Qunun's successful getaway would inspire others to copy her, but powerful deterrents remain in place. If caught, runaways face possible death at the hands of relatives for purportedly shaming the family. The issue of male guardianship is extremely sensitive in the kingdom, where conservative, tribal families view what they consider to be the protection of women as a man's duty. Around a dozen women's rights activists have been detained, many since May, after they campaigned against the guardianship system. Some had also wanted to create alternative shelters for women runaways, saying that current shelters in Saudi Arabia are run similar to detention centers. There is a government app that offers a range of government services, including allowing men the ability to grant or deny a woman permission to travel. Some young women who have fled Saudi Arabia managed to access their father's phone and change the app's settings to grant themselves travel permission. The app is merely implementing existing laws, and removing it would not change or remove the guardianship rules in place. Still, the feature has sparked calls in past weeks for leading tech companies like Google and Apple to block access through their app stores.